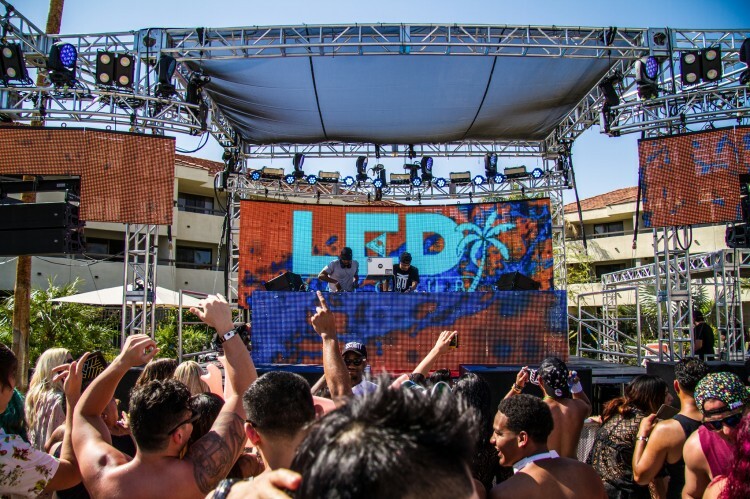 The music scene has been hustling and bustling this whole past weekend, with Coachella starting its first weekend’s festivities, and LED hosting the LED Day Club at the Hilton Palm Springs hotel about an hour away from the polo grounds. 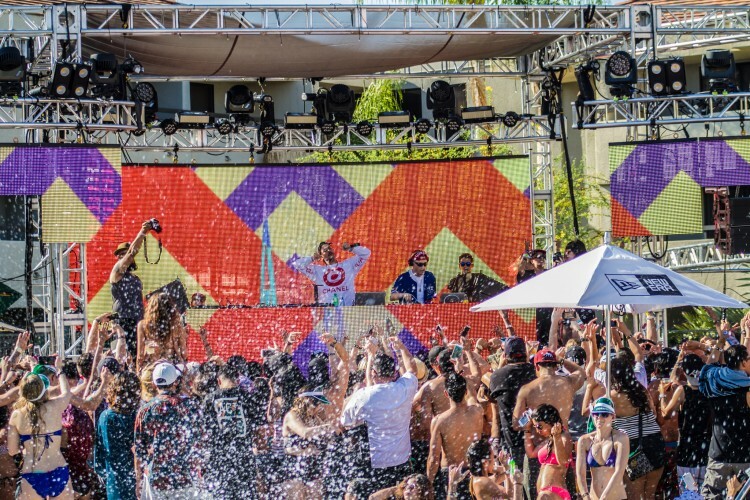 They started their parties on Thursday with Chromeo headlining, Deorro with Panda Funk on Friday, Odesza on Saturday, and ending the first weekend with Flosstradamus and Stooki Sound. 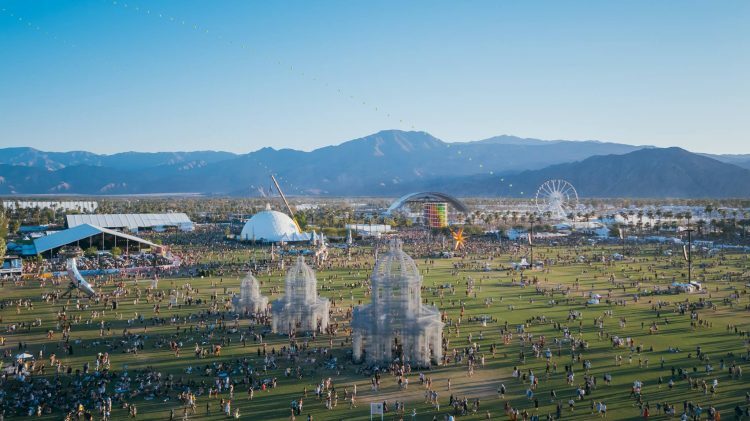 The distance was not an issue for these party goers though, as some took shuttles that left from the hotel to Coachella once the day parties ended, and others just came out to Palm Springs to take a quick break from their everyday lives, enjoy some sun, good vibes, and good music. We had the pleasure of stopping by on Sunday to cover the trap house, which is what I like to call any show with Flosstradamus headlining. 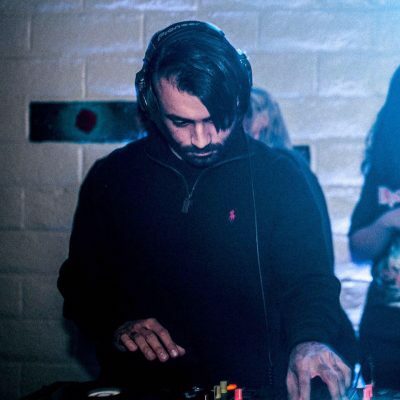 The opening talent awaiting us was Klatch, a rising underground house artist from Los Angeles who provided the opening deep vibes to get us grooving before the trap was to be run. His set had many songs that I’ve never heard before, which is something I’ve come to appreciate when I go to shows. One particular song that caught my attention was his collaborative remix with SNBRN of All She Wants by Ace of Base, which I did have to look up and save to my very selective list of likes on SoundCloud, because it was that good. 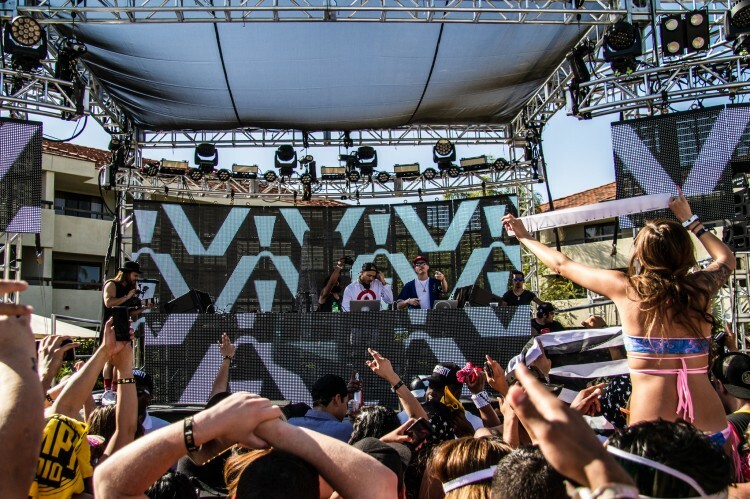 Next up was Stooki Sound, who was the perfect act to play right before Flosstradamus. Ever since I heard their track Uppers with Mr. Carmack, I knew that I was in for a treat when I saw their name on the lineup. They played a lot of well known trap bangers mixed in with their originals and remixes that kept everyone at a good pace before the absolute destruction was to continue. The highlight of their set for me was when they dropped their remix of Missy Elliot’s Work It, and everyone in the pool was splashing at the beat drop. Even the security guards were turning up with us. Now I’m sure everything that can be said about Floss has already been said, but that’s because they never disappoint with their sets. From watching them at my very first rave I’ve ever attended, to the 4th time I’ve seen them at this event, they’ve only gotten better and better. Their entrance was nothing short of epic, and the set that proceeded was nothing short of mind-blowing drops and dirty bass. 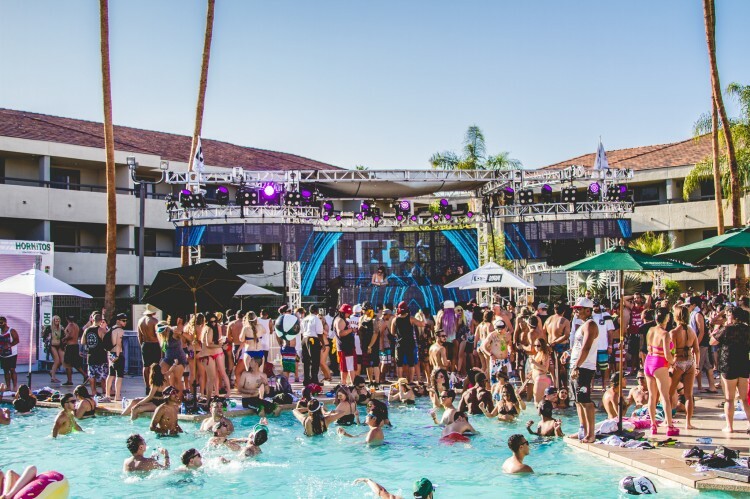 They premiered a new track, and got everyone to go around the edge of the pool to jump in at the drop, making the ultimate splashy climax to their set. My favorite thing about them is that they always mix electro into their sets as well, with the best example of the day being I Am Legion‘s Choosing For You (Nightwatch Remix). That made me see how well some variants of house music blend in with trap, and make the overall experience that much better. If you ever have the opportunity to catch Flosstradamus at a show, I would highly recommend it, whether you’re fan of trap music or not. The music and vibes from the crowd are something everyone should experience. Last up on the bill was Brazzabelle, who ended the day with a set chock full of progressive house ragers. You can never go wrong watching her spin, since she always throws in twists to keep you on your toes. Her remix of the classic 90’s hit What Is Love is always a pleasure to listen to, and I’m glad we got to see her perform. 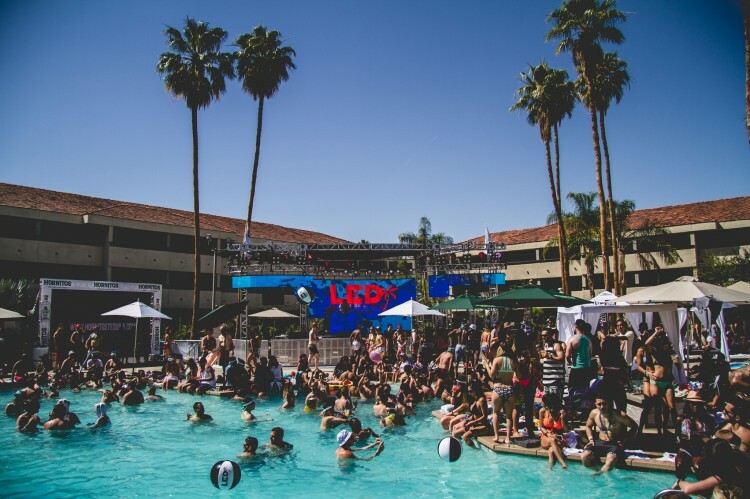 So if you’re looking to pregame before going to Weekend 2 of Coachella, or just trying to find something to do next weekend, I would highly recommend the second round of the LED Day Club. This weekends artists include Porter Robinson, Skrillex, and DJ Snake to name a few. Grab your tickets here!